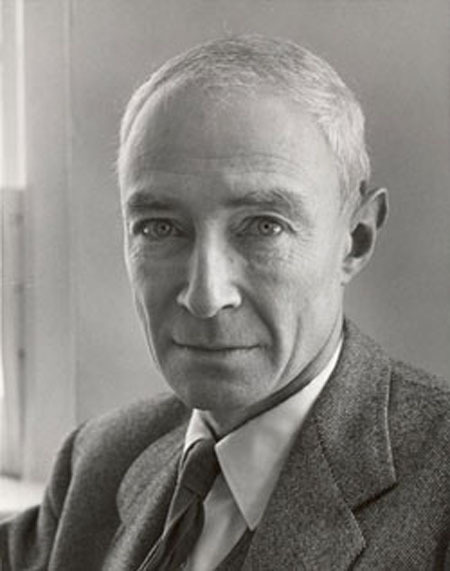 Born in New York City to a wealthy German immigrant family on April 22, 1904, Oppenheimer studied at a boarding school in the desert in Los Alamos, New Mexico, and then attended Harvard University, where he excelled in both the sciences and languages. Graduating in 1925, he went to England to study atomic physics with the great physicist ERNEST RUTHERFORD at the Cavendish Laboratory in Cambridge. He was soon invited to the University of Göttingen, one of the great German schools where the radically new science of quantum mechanics was being developed. He received his doctorate from Göttingen in 1927 and returned to the United States to teach and conduct research on the energy of subatomic particles at the University of California­ Berkeley. In 1939, at the beginning of World War II, NIELS BOHR brought word from Europe that German scientists OTTO HAHN and LISE MEITNER had discovered nuclear fission: that uranium atoms could be split into smaller particles, releasing huge amounts of energy. Germany had leading scientists in nuclear physics, plus access to all the raw materials to build an atomic bomb. Leo Szilard and ALBERT EINSTEIN warned United States President Franklin D. Roosevelt of the danger of the German leader Adolf Hitler developing such a weapon. After much delay the American government hunched the secret Manhattan Project to make a bomb to counter German threat. Oppenheimer was chosen as the leader in 1942 and, recalling the New Mexico desert where he had attended school, he built a secret laboratory there. The task was daunting, the pressure tremendous, and the risk terrifying, as scientists knew the enormous destruction that splitting uranium atoms could cause. Within three years the group tested the first nuclear weapon on July 16,1945. Two bombs, one built from uranium­235 and the other from plutonium­239, were ready to use within three more weeks. The scientists who remained in Germany had never succeeded in making a bomb and that nation had already surrendered, but the war in Japan was raging on. After a great controversy the bombs were dropped on Hiroshima and Nagasaki, Japan, on August 6 and 9, 1945. Japan surrendered soon after and World War II was over. In 1947, because of his unique blend of scientific and leadership skills, Oppenheimer became the director of the Institute for Advanced Study at Princeton University, where Einstein spent the last years of his career. Because of his opposition to the hydrogen bomb, nuclear devices with 50 times the explosive power of the bombs of the Manhattan Project, and his acquaintance with members of the Communist Party in his youth, he was stripped of his security clearance and role as adviser to the Atomic Energy Commission in 1953. In 1963 President Lyndon Johnson rehabilitated Oppenheimer by awarding him the Enrico Fermi Award, given to scientists who advance the understanding of nuclear physics. Oppenheimer retired in 1966 and died of throat cancer on February 18, 1967. The Manhattan Project, under the direction Oppenheimer, changed the course of history in the twentieth century. It ushered in the atomic age, with the threat of nuclear annihilation hanging over all countries of the world. Oppenheimer realized, on the morning of the first successful bomb test, the long ­term impact of what his group had accomplished. He wrote, “We knew the world would not be the same. A few people laughed, a few people cried. Most people were silent. I remembered the line from the Hindu scripture . . .’Now I am become Death, the destroyer of worlds’.” Oppenheimer’s realization of the impact of the development of nuclear weapons and his opposition to the building of hydrogen bombs helped to galvanize anti­nuclear protests early in the atomic age. While thousands of hydrogen bombs are stockpiled around the world today, the ongoing protests against nuclear arms build­up gathers strength from the fact that the originators of the first nuclear bombs disapproved of their continued development and deployment. Soon after the Manhattan Project’s development of the atomic bomb, scientists began developing nuclear reactors for commercial energy production. In 1956 the first nuclear power plant was completed in England, and the next year the United States followed with its first nuclear plant. Until the 1970s nuclear energy production steadily increased. Since then, however few new plants have been built and production has slowed on many plants, as concern for safety increased. Some countries today, such as France, which lack adequate sources of other forms of energy, still rely on nuclear power.